As efficient as you would expect for a German establishment and spotlessly clean. Decent facilities the only downside being that the queues at food and drink outlets were extensive although admittedly it was the evening rush hour. Overall I would rate it as between 'good' and 'excellent'. Arriving from EDI. Positives the passport check (I am not a EU citizen) was perfunctory and the baggage arrived quickly. Negatives - the bus to Bonn is not signposted and its frequency is useless by German standards (every half-hour) - in trying to get a ticket for it I ended up being sold a rail ticket that wasn't what I needed; and it is a very long walk from the terminal proper. Three stars but only just. Marvellously laid out quick and easy access from the terminal to public transportation excellent directional signage throughout the terminals and one of my favorite European airports. What a pleasure to use a smart clean airport; T2 is an example of how an airport should look and work. Even flying on a LCC easyJet we weren't treated like a second class user. This is an efficient small airport. 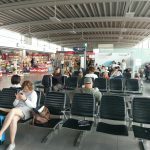 There are good connections within Europe and some long haul scheduled flights (but not enough). The security process is relatively quick as is immigration. The restaurant facilities are limited but satisfactory. The transport to Cologne by train is fast but the bus link to Bonn although rapid is only every half-hour and has been reduced in frequency - a mistake that needs to be rectified. Still taking everything in consideration it is much more pleasant and user friendly to travel through Cologne/Bonn Airport than it is through a big airport like Frankfurt. Arrival at airport through railway station convenient but no automatic doors to leave station; not good when carrying heavy luggage. Signposting clear enough to me fellow travellers confused. Check- in spacious. Security checks slow due to under-staffing. Airside amenities basic and expensive. PA- system superfluous as not understandable. Toilets well kept. Baggage claim area cramped. Facilities upon arrival non-existent except for a bench outside the baggage claim area. Walk back to railway station through a roofed outdoor path next to the terminal building. In short: if you're able bodied alert and can make your own entertainment this airport is for you. Overall spacious and clean airport. Cheapest long-term parking P3 was full. Obviously not an incident because there was a staff member to advise about other possibilities present. Had to choose between queuing or going to P2. Travelling by GermanWings was outside Schengen which meant departing by bus from a (temporary?) big party tent connected to the Terminal 1 building. Very hot because of the sun on the roof. Passport control on return also in a tent. Bagage reclaim big enough (now?) no problems there. Picking up co-passengers after collecting the car from the parking turned out to be a big problem at least for Terminal 1. The natural place to wait seems only accessible for taxi's and the like. Advice: collect them from the departures level where they can wait on a visible spot. 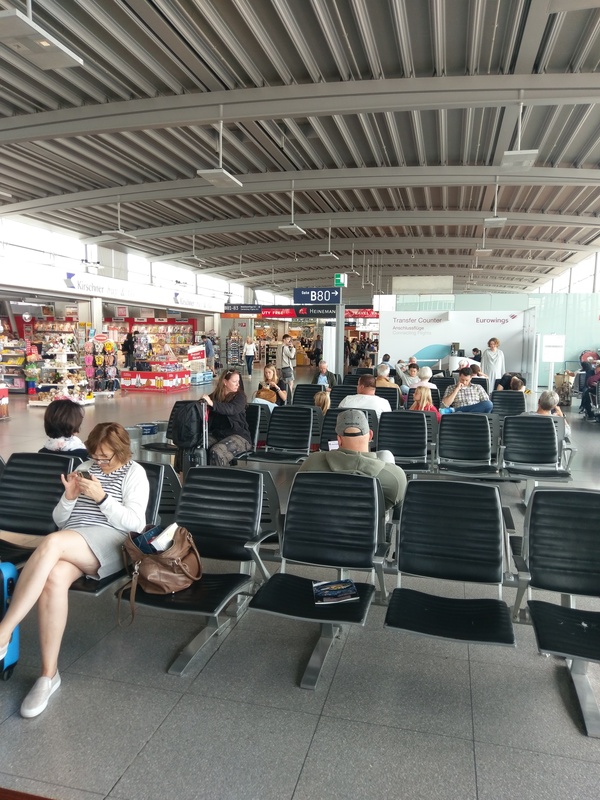 At CGN Germanwings use their own terminal 1 which they only share with LH. Arrivals: Passport control and baggage reclaim in Terminal 1 old outdated and extremely small. Once outside you can actually start enjoying the airport especially when you reach T2. Very nice layout spacious lots of shops bars etc all in glass very modern. Connection on the train to the city centre easy to find and use. Regular service at very good price. Departures: From train station very long way to walk and not very good signposted. Once in actual terminal it all changes. Germanwings' check in area very big and spacious it was fairly busy yet it didn't look chaotic. If travelling with hand luggage it is possible to use self service check in which is easy to use. Security very quick and polite. Shopping good for the size of the terminal. If travelling outside Schengen my advice wait to go to your gate until last minute as once you clear immigration there is no shops or bars. No airbridges in terminal 2. Departures side of airport is very modern spacious clean good sign posted very nice to use. They need to do something about arrivals tho as it is not very nice and gives wrong impression. There is also a small viewing area on top of the terminal which is free and gives good overview of the airport. CGN is a pleasant small airport. It reminded me of BRS except that CGN used a jetway BRS didn't. Train connection is kind of weird. I wanted to use my free luggage trolley to the train door which means using the elevators which never are easy in any airport. The elevators in CGN are hard to find and the buttons are really confusing with the labels not clear and worn off: I ended up on the wrong floor several times in the terminal and in the train station I ended up on the wrong side of the tracks. The train ticket machine wouldn't read my VISA bank card so I had to go back through the terminal and crazy elevators to find an ATM machine which did work to give me cash to use in the train machines. When I arrived in the Cologne Main Train Station the same type of machine accepted my bank card with no problem and a train staffer was there to help also. Also flying out be aware that you can't get into Burger King on the other side of security. The only normal place to eat is Subway and the attendants there ignored me so then I went over by the Continental gate for a German place for Cappucinno and Crescent which was okay. Otherwise just a handful of shops and not much else so just remember that it really is just a small airport. The security seemed okay but the security staff doesn't speak English and there's no fast line for guests who know what they are doing but otherwise no real problem. (I have a metal medical implant and am too familiar with security in many airports.) Okay that's all. Probably comparable to HHN (which I've used many times) but maybe better because of rail link and closeness to an actual city.